After we got a good night of sleep in Arlington, we took a few moments to visit Fort Worth with Martine and Frederic before taking the road on the way to Houston! We only had a few hours to get to minute maid park since we didn’t have a day off between the two Texas games. On the way to Houston we encountered a lot rain. We surprised us since we weren’t expecting that much rain going through Texas. No problem though! We got there safe and sound! When we arrived in Houston, we were really impressed by the look of the city. The downtown can be see for pretty far with his tall glass walls buildings that reflects the sun. Houston is one of the biggest city in America and is home of many research and treatment medical facilities. The city is surrounded by a huge highway and we lost (again) a few minutes in the traffic jams. Still, we managed to get early to the ballpark so we could take our time and visit. 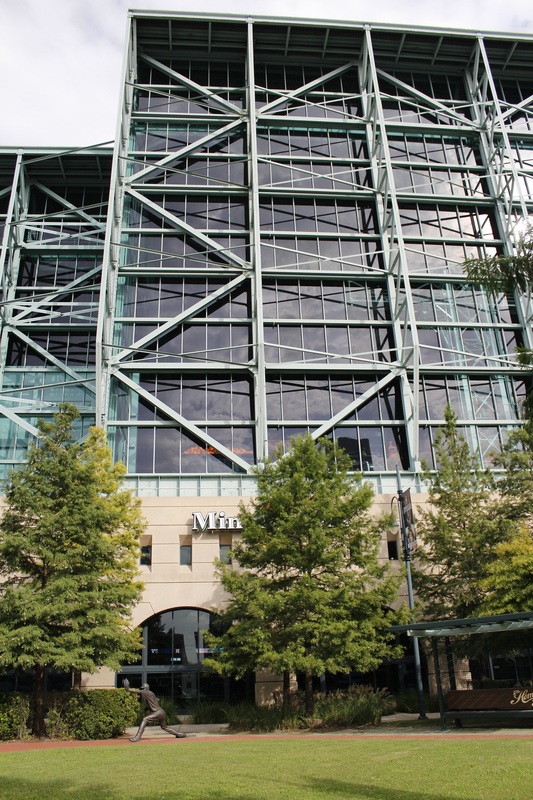 The Minute Maid Park is located downtown. It is a ballpark with a retractable roof. Walking around the ballpark, we saw the huge windows that are letting the light go inside the ballpark when the roof is close. 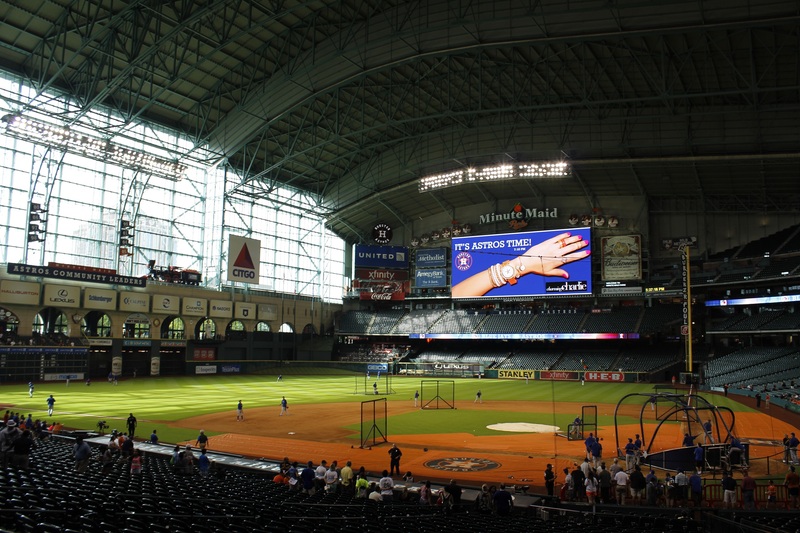 The weather in Houston is known to be hot and humid so we’ve been told that the roof is rarely open during the summer. It’s mostly open during the first weeks of the season. When there’s no game at the park, they open the roof so the natural grass can get some sun and rain. We got our tickets from will call and headed inside the ballpark where we were meeting with William: an employee of the Astros that we met on twitter. 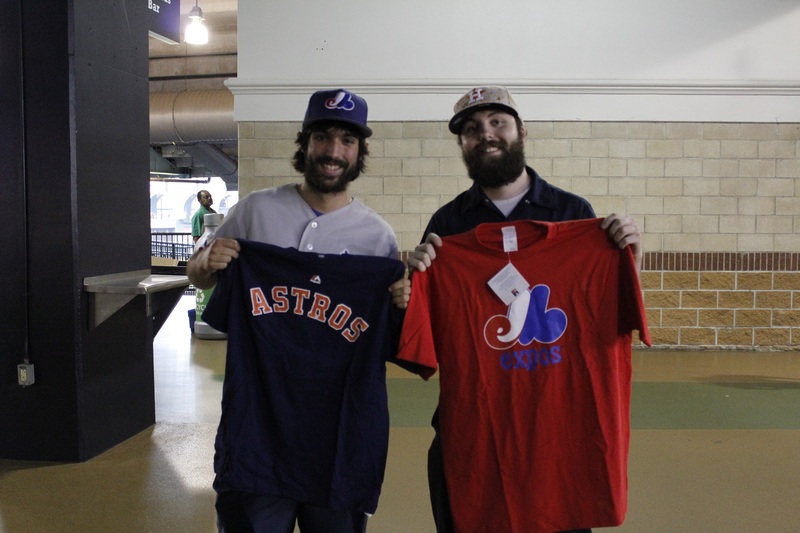 We traded t-shirts: Expos vs Astros. 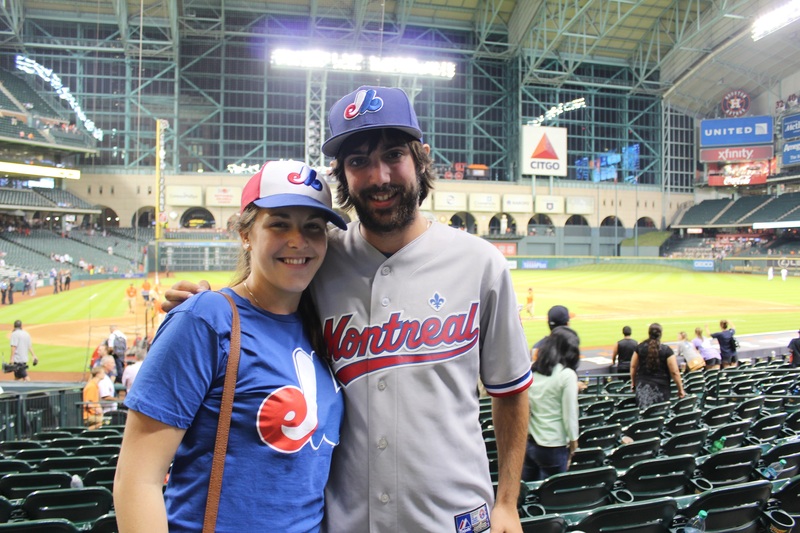 We took the time to chat with William and he explained us a few things about Minute Maid Park. He told us that the team put money in the last years to renovate or create fans oriented features. For example, we saw that the food stands were offering a large variety of food. The team also added more fan store and a kid activities section located outside of the ballpark. William told us about the special features of the field. In center field, they build a hill (honoring Crosley field) and a flag pole (on the field!) honoring the old Yankee and Tigers stadiums. The pole is considered in play if the ball touches the pole! Some persons are complaining about those features but it’s a tribute to the old ballparks where we could find those kinds of obstacles. The center field is also the deepest in the MLB. We had to let William go since he had to work! It was really nice meeting him. We did our usual ballpark tour and we realized that the team is really targeting the fan experience. 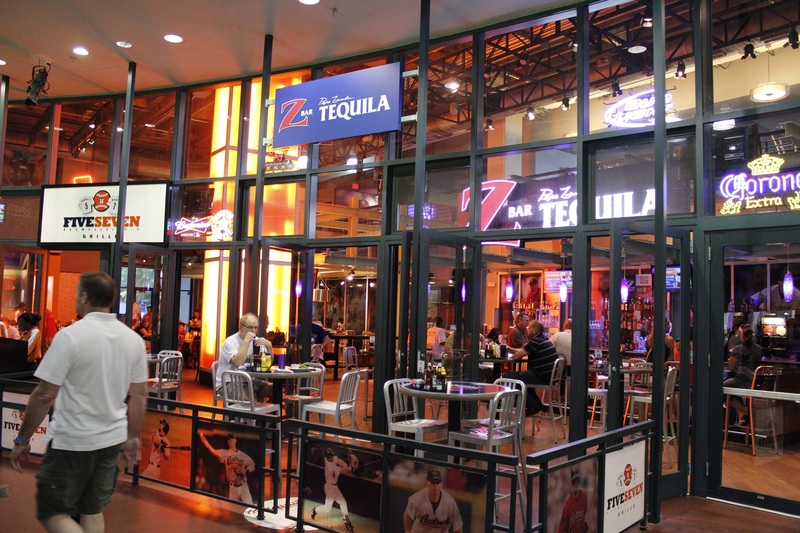 We saw the different restaurants and bars where you can grab a drink or just eat before the ballgame. Some with a direct view on the field and some more in a restaurant style where you can be seated. Behind left and center field, we walked around the Home run alley: a long walkway with a view on the field where we saw a few ball landings during the batting practice! Next to that, we saw the famous home run pump: a gas pump that keep counts of the Astros Home run since the opening of the ballpark. Other funny thing: if a player hit the foul pole with a ball, everyone in the ballpark gets a sandwich at Chick-Fill-a! Those are the little things that make you appreciate a ballpark more than another. 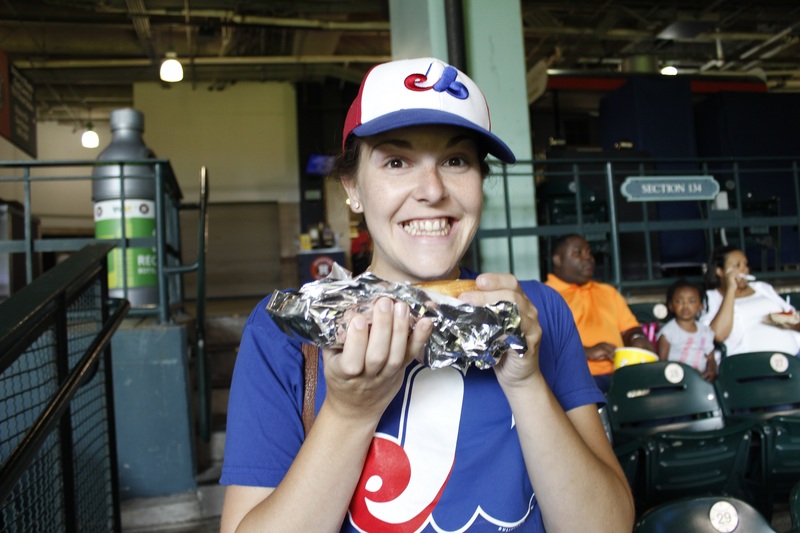 We totally forgot to say: It was 1$ hotdog night! It reminds us of the good old times at Olympic Stadium. Plus, we both had a coupon for a free hotdog, popcorn and drink. While walking around the park, we were approached by Michael Selph: a local music artist that saw our van in a gas station not too far from Houston (our van decorations are working fine!). He has Cajun blood in his veins so he took a few French classes when he was in school. We asked him a few questions about the relations that the Astros fans had with the team. Michael told us that the relation between the fans and the owners was really difficult. Just for example (can seem stupid but) the ballpark has been opened in 2000. 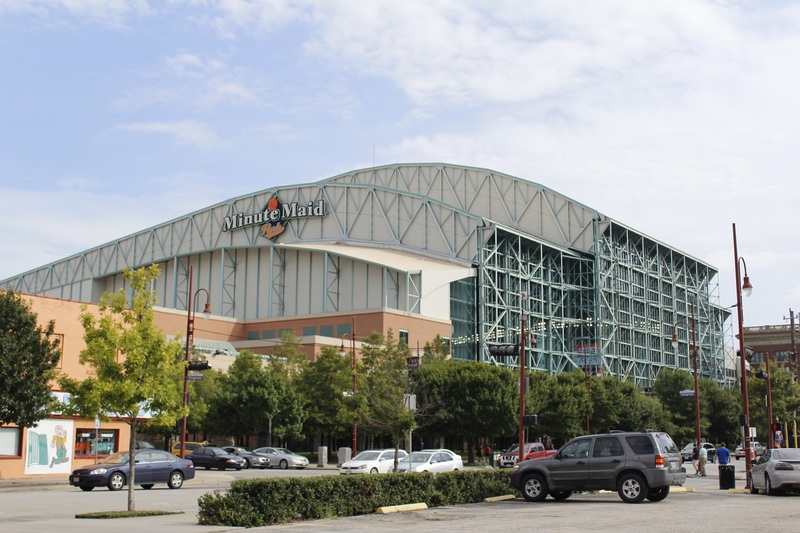 It already had 4 different names: The ballpark at Union Station, Eron field, Astros Field and Minute maid Park. He grew up being a Astros fan he was really happy that the team got their new logo back after a few changes over the years. He told us the fans had trouble dealing with the constant changes with the team even though they were happy to get a new ballpark. We are really glad Michael came and talk to us. He gave us his CD so we can listen to some good tunes while we are on the road between ballparks. You guys should check his website and listen to his songs (Link here). We had seats on the upper deck (like always!) and we both thought that it was really not as nice as the main level. The ushers were really nice to us helping us to get to our seats and taking pictures (our camera tends to have problem when we are trying to get our picture taken. By the way, you cannot get service at the food concessions during the national anthem! We will know for next time. 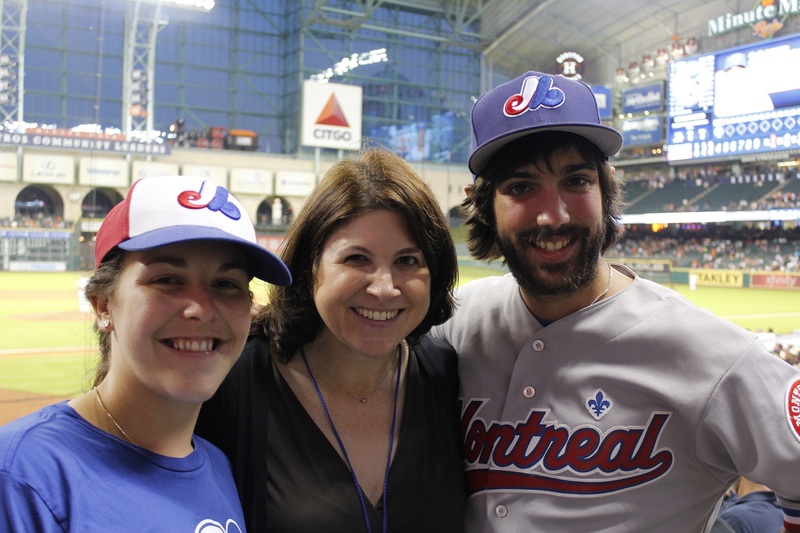 At our seats, we met with Kennon Riley, an Astros Blogger that we also met on twitter. He came to our places so we could discuss about the team. He told us about the difficulties that the team had after losing the World Series back in 2005. Like many teams, they went into sellout mode and a lot of players were dealt to other teams. They seemed to be struggling in consistency since then. The team as a rich history with players likes Lance Berkman and Jeff Bagwell. According to Kennon, the Astros also have a hard time getting rivalries with teams. The team has been recently moved to the American League (and they have a hard time getting used to it). Fans will mostly show up for games against teams that they used to have rivalries. We could understand that not a lot of fans showed up for this game against the blue Jays. Kennon confirmed our theory that the team is counting on the fans from the other teams to fill up the stands. When the Astros hit a home run or win a game, a big train runs down a railway on top of left field. Kennon explained us that the ballpark has been built where was standing the old Union train station. There is still part of that station that remains next to the ballpark: a nice red brick building that you can see from inside Minute Maid Park. Game time: starting pitchers were Hutchinson for the Jays and Buchanan for the Astros (only his second start of the season). Jays big guns got heard that night with four solo home runs (They leas AL in the home run category). The Astros still managed to get a two runs lead in the third inning. Singleton also hit a home run earlier for Astros. Jays rallied up and came back from behind. They tied the game on a sacrifice fly and, in the top of the 9th; Chad Qualls threw a gift to Nolan Reimold who hit his 2nd home run of the game. Janssen went to the mound for the Jays to finish that game. Final scrore: 6-5 Blue Jays. While we were chatting with Kennon, Amanda, who’s responsible for the Astros social Medias, came to our seats with a big surprise! They upgraded our tickets in the lower tier behind the Astros bench! It was really nice for us to get to see the game that close from the field! 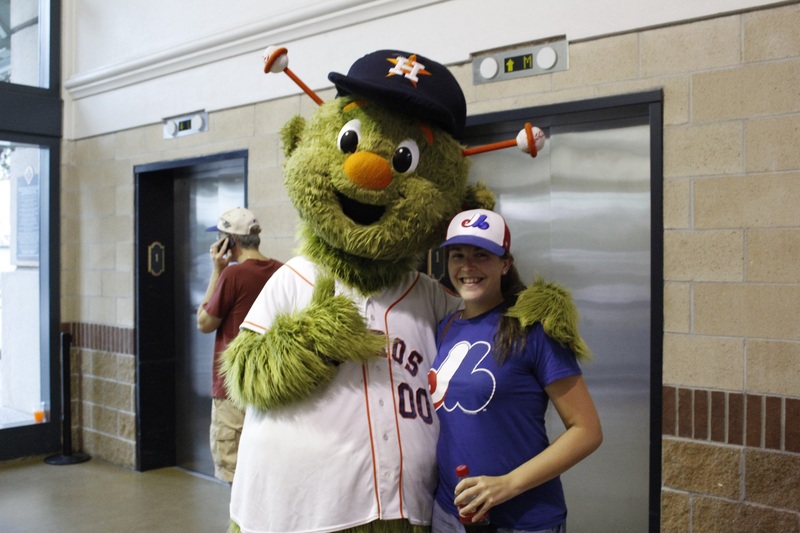 Amanda also told us about the different promotions of the Houston Astros. For example, the food concessions are creating some special dishes that will be only available for one series. 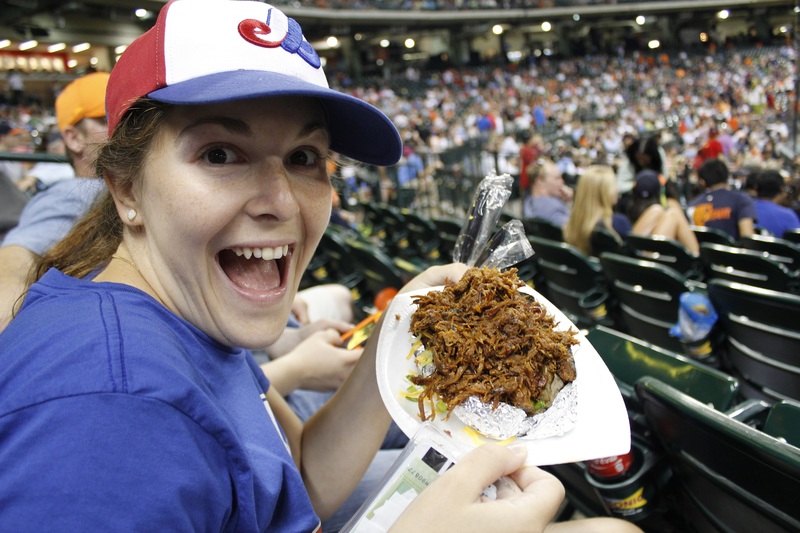 That night, for the series against the Jays, they were serving something similar to poutine but with a Texan style! For our American friends who have never been to Quebec: Poutine consist of French fries with special cheese curds and topped with gravy! Also during this weekend, the team was honoring ex Astros players. The fans will get a bobble head on Friday and Sunday and a replica jersey on Saturday. She suggested that we try the BBQ loaded potato. It consists of a baked potato with cheese, bacon, green onions and a big load of brisket meat! Delicious! We really want to say thank you to Amanda and the Houston Astros for this opportunity. It is really nice to see teams that recognize and encourage us in our project! We will be back in Houston that’s for sure! 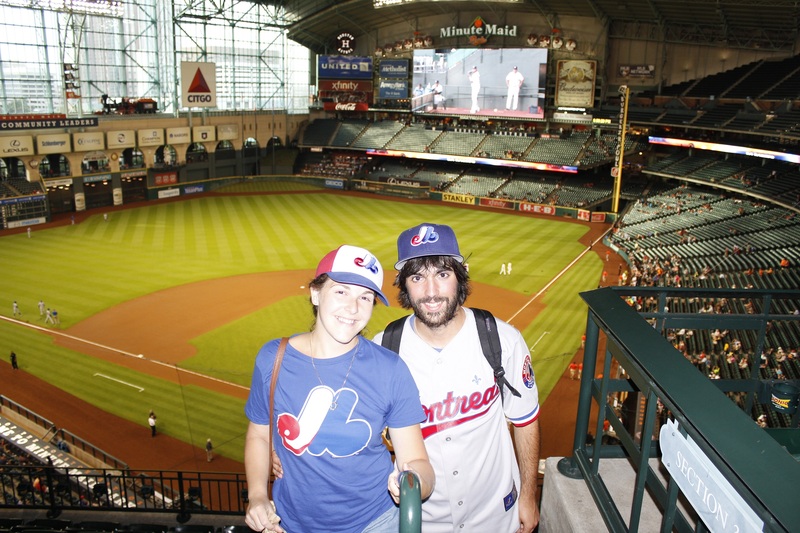 At our new seats, we discussed a lot with Astros fans sitting beside us. 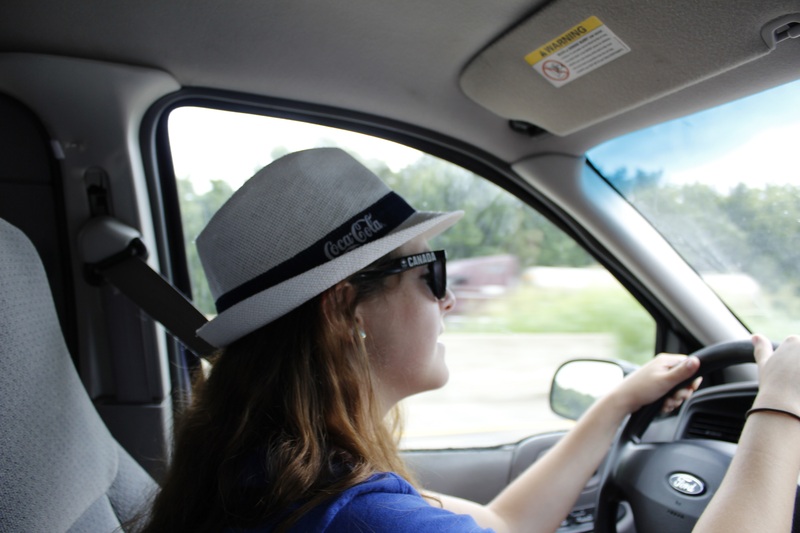 We are really happy that many of them recognize the logo on our shirts and hats! Whether they just heard about the team or they remember it, we are happy that the Expos are still in people’s mind. We had to major happening at the game that was on our ‘’ballpark checklist’’: a proposal on the giant screen and a runner on the field late in the game. The Astros are a team that is living in the shadow of the Texas Rangers (which identify themselves as THE Texas team). We asked around and nobody told us that there was a huge rivalry between both teams since they are playing in the same division. Kennon told us that this might happen when both teams will be having good seasons at the same time. We saw that the fans were really happy during the game last night even though they lost. We hope for the team that better seasons will drag much more fans to the games. 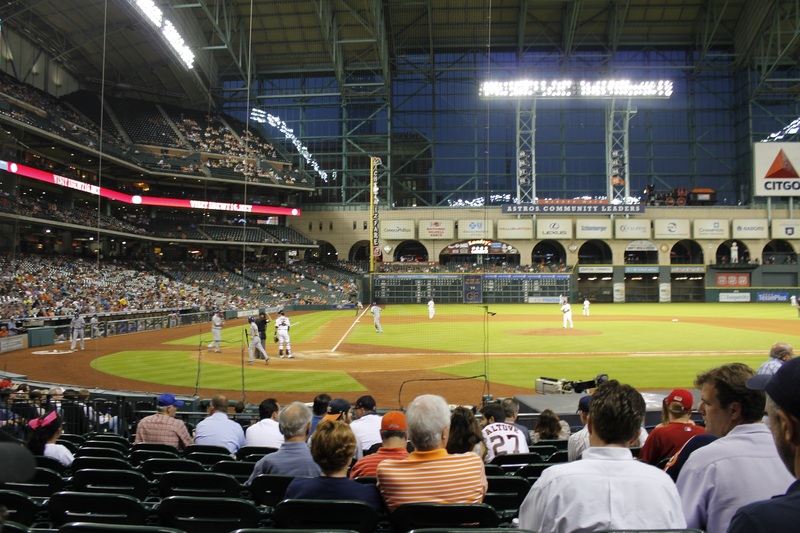 Talking ballpark, we wonder if the team is not looking for a new identity. New ballpark name, the new logo, etc. We really appreciated the different ballpark features: train, flag pole, gas pump, etc. We were wondering if the team should let go of some things so people could focus more on some particular features. This will probably be a question when we’ll build a new ballpark in Montreal: What features reminding us of our history should we bring to the new stadium? A section with the old Olympic stadium seats maybe? We would like to thank again William, Michael, Kennon, Amanda and the Houston Astros for that wonderful night. We wished them luck for the remaining of the season. People in Houston were nice so we are leaving with a smile on our face! We slept in a Wal-Mart Parking lot in the San Antonio suburbs and we are driving west towards our next stop: Chase field and the Dbacks! P.S. In both Texas ballparks, in the 7th inning, right after singing: take me out to the ball game, we sing: deep in the heart of Texas! And we clap our hands!